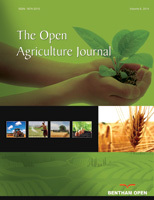 The Open Agriculture Journal is an Open Access online journal, which publishes research articles, reviews and letters in all areas of agricultural science. Topics covered include, agronomy; plant and animal breeding; genetics; agricultural biotechnology; crop physiology and agroecology; soil science and agroclimatology; agricultural economics and rural sociology; and sustainable systems. Agricultural biotechnology (including tissue culture, molecular markers, molecular diagnostics, vaccines, genetic engineering, genome editing as well as synthetic biology) to modify living organisms: microorganisms, fungi, plants and animals).